Finally! My review of the Matrix PowerWatch is here. This is a watch that I’ve had since the fall of 2017 but I waited to do a review since the watch was still under development. The Matrix PowerWatch is different in that it uses body heat to recharge its’ battery and also uses body heat in its algorithm to determine calorie burn estimates. 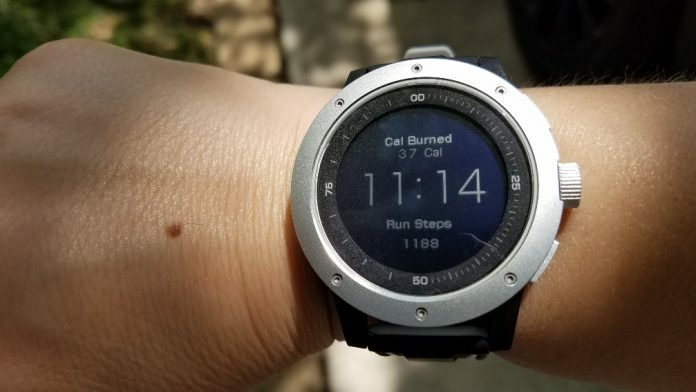 In this review I tested the estimates for calories burned, distance, and pace against the Garmin Fenix 5s, Fitbit Versa, Samsung Gear Sport, and Nokia Steel HR. The results were both surprising and enlightening. In this review, the PowerWatch tested out very well for calculating calories burned during running exercises but not as good for walking. If you’re a runner, this may be a good watch for you. Otherwise, this is a great watch for those that love new technology and collecting watches. It is cool looking, especially the Black Ops which I really like the looks of but I think the Silver looks nice too. There are three Powerwatch options: silver, black ops, (available on Amazon) and the more pricey X model. The X was just released and the only model of the three that supports notifications. The silver and black models have the same exact features under the hood. Why did it take so long to do this review? Well, this is a watch that was partially crowdfunded through Indiegogo where I first discovered it. Like many crowdfunded products, the time from concept to delivery was long and sometimes painful. A lot of tweaking of the firmware was needed and I think still needs some more work but I’ll get to that. The features of the Matrix PowerWatch are limited for something that is marketed as a smartwatch. The smartest things about it is that it uses body heat to power it and help calculate how many calories you burn which is pretty smart! Beyond that you’ll get basic features such as: a pedometer, a stopwatch, sleep monitoring, running mode for running exercises, daily distance estimate, daily calorie burn estimate and daily stats that are synced to its mobile app. With the X you’ll also get notifications and an alarm. Syncing isn’t automatic but rather must be done manually and this is likely meant to conserve power. To sync the watch, you first open the Matrix app on your iOS and Android smartphone and then navigate to the watch settings screen and press the bottom right button to sync. It’s recommended not to sync multiple times in a row to reduce power consumption. Syncing 2-3 times a day, or even more than that though I don’t know why you would, doesn’t seem to affect the watch in my experience. 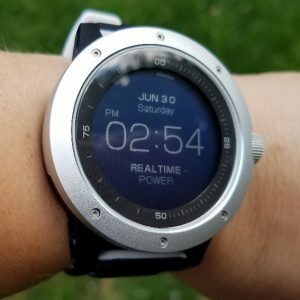 The more I’ve experienced the PowerWatch the more I’ve realized that many of its features are limited by the need to conserve power. Apparently, the amount of power generated by body heat isn’t enough to power more advanced features, unless the watch battery is large, as is the case with the X. The X is a big watch at 50mm in diameter and 13.5 mm in thickness. In contrast the Silver PowerWatch and the Black Ops are 46mm in diameter and 12.5 mm thick. The thickness is what makes the watch appear large and if you wear long-sleeved shirts that may be a problem. The overall build quality of the Powerwatch is quite good. It doesn’t feel cheap and it really couldn’t be made with cheap material because the case is an important part of the heat transfer process. The packaging it comes in is impressive and let’s face it, this is the type of watch that tech geeks will most appreciate and want to keep since it’s really the first of its’ kind. Well, actually Seiko tried the same thing back in the late 1990s but the Powerwatch is being released in the era of smartwatches and fitness trackers so the expectations and features are different. It’s certainly not a dainty watch but it is comfortable on the wrist and despite its size is lightweight and I’m able to sleep with it on. Much of the comfort depends upon the strap which you can swap out with nearly any 22mm wide band easy enough. One thing I did do fairly quickly after getting the silver model was change the stiff nylon strap it came with to a much more comfortable silicone version. Not only was the nylon strap uncomfortable to me but it also began showing wear very quickly. The Black Ops comes withe a metal band and X comes with silicone. So why would you or I want a watch like this? Initially, what interested me the most was the way the Powerwatch uses body heat to calculate calorie burn. Fitbit, Garmin, Samsung, etc., all of their own algorithms for determining calories burn but none of them include body heat in their calculations. 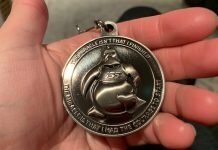 The was the number one reason I bought it. AND, of course, it can’t be overstated how nice it is not to have to charge the watch, EVER! There’s no wires to mess with or take along on trips. All you need is you. According to Matrix, the battery can last up to one year without it being on your wrist to recharge, though I make sure I wear it often to ensure the battery remains in good shape. Something that is missing from the watch, at least at the time I’m writing this, is a way to see just how much power my body is generating to recharge the battery. New watch faces have been promised that will show this data but I don’t know why it’s taking so long to get those watch faces released. There have been a handful of different firmware versions over the past few months. The earlier ones, I felt, were better than the last couple in that step tracking and distance estimates tested better for me. The firmware version I’m testing with is version 01.07.00.00. I’m hoping another firmware update will improve accuracy once again and finally give us those watch faces that were promised months ago. When that happens I’ll be sure to update this review. Now that the PowerWatch is being sold on Amazon and the PowerWatch X is in production, hopefully more time can be devoted to getting the firmware up to snuff. The PowerWatch uses a low power always-on LCD screen. There is a “screen saver”, really a power saver screen that will show if the watch doesn’t sense movement for a number of minutes but the display screen comes back on when you tilt your wrist towards you. Navigating through the watch is done using the top and bottom right buttons and by twisting the crown. Sometimes the crown behaves a little unpredictably and I have to twist it more times than what should be needed to display the correct screen. Twisting the crown while on the main screen will display the time and the temperatures of your skin and the case of the watch. Below: One of the Daily Activity Screens showing daily step count, estimated distance, and total daily calories burned. Twisting the crown will take you the sleep monitor screen. The screen display is easily seen outdoors but more difficult to see in darker conditions. It does have backlighting but it’s rather dim. It only lights up from the bottom right side of the face. Again, this is a power conserving method that works okay but really needs to be brighter. Interacting with the watch is easy enough. You’ll probably be up to speed with its’ menus and various features within a few minutes. There’s no learning curve here. Besides really wanting more watch faces to choose from, I also wish that the main screen showed more data on it so I wouldn’t have to scroll between two different screens just to see how many steps I’ve taken. I’d like the time, date, my steps, calories and distance estimate all on one screen. I’d also prefer that the data shown when in Running Mode was on one screen as well. It seems unnecessary and impractical to scroll between different screens when you’re running. Running Mode shows your distance, pace, calories burned, steps, and elapsed time and I think all of those could be on one screen. So let’s get to it! How did the watch test out in step tracking, distance estimates, sleep tracking and calorie burn estimates? Step tracking has tested out well for me. I’ve done several 100-step walks and the PowerWatch was never off by more than 2-3 steps. It does take it a while to begin counting steps in the morning due to sleep tracking being off. I can get out of bed, walk to the kitchen, feed the dogs and the cat, grab a granola bar and head back to bed and no steps are counted, usually. Again, this is more of an issue with sleep tracking not recognizing that I’m awake rather than poor step tracking. You’ve probably already guess how well sleep tracking tested out with version 01.07.00.00. It’s not going so great but it used to be better so I know it’s possible to have more accurate sleep monitoring with the hardware. It’s apparently just a firmware issue. Sleep tracking used to be more primitive on the PowerWatch. In the initial few firmware versions, sleep tracking wasn’t automatic in that it sensed when you fell asleep. You had to press a button and tell it you were going to sleep but it knew when you got up. The watch is usually fairly accurate at knowing approximately when I fall asleep but it’s not so great at knowing when I wake up, especially if I wake up during the night but didn’t get out of bed. Also, sometimes it thinks I’m sleeping when I’m not. So yeah, the sleep tracking is off right now. 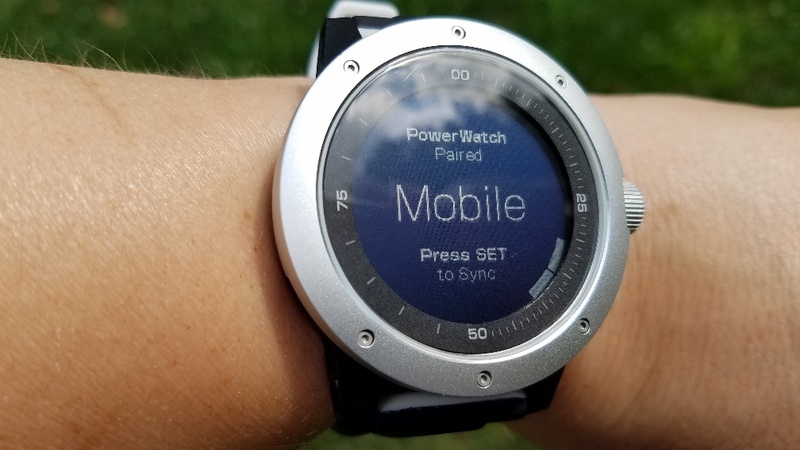 Since the PowerWatch doesn’t have a built-in GPS or the ability to connect to your phone’s GPS, it relies upon your steps and likely your stride length to estimate distance. I did three walks taking the same exact route all three times, comparing the PowerWatch to three different watches, the (see on Amazon), the Samsung Gear Sport, and the Nokia Steel HR. I also used a mapping tool to estimate the distance and according to it the distance is .65 miles. I’m assuming there may be a margin of error of .01-.04 miles with the tool but this is probably a good number to compare to. In this first test versus the Fenix 5s. The Fenix temporarily lost GPS signal and that’s the first time that has happened to me. That’s likely why there is a time difference and why its distance estimate is a tenth of a mile off. The PowerWatch was off by .08 miles in this test. 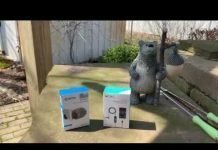 The next test was against the Samsung Gear Sport. The Gear Sport (see on Amazon) distance estimate was almost spot on with the mapping tool estimate while the PowerWatch was off by a tenth of a mile. The last test was against the Nokia Steel HR since it also doesn’t use GPS to calculate distance. It looks like I was averaging a little less than 3 mph in this walk. I’m not sure why the Nokia had me walking for 13 minutes compared to the 11:14 of the PowerWatch. For distance, it looks like the Nokia Steel HR (see on Amazon) did a good job. For calories, the PowerWatch is closer to the 44-54 calorie estimate (see below). And for the calorie estimate, which I’ll be getting to in a second, the Gear Sport tested out the best against a calorie calculating tool. It had estimated, based upon my weight, approximate time walking, and a MET value of 3.5 (walking on a firm surface, moderate pace, 2.8-3.2 mph) that I had burned 44 calories. At times, I was walking faster than 3.2 mph and at a MET value of 4.3 for a more brisk walk I would have burned 54 calories, so it’s likely that I burned somewhere between 44-54 calories for each test. Actually, the Samsung Gear Sport (on Amazon)testing out the best for both calorie and distance estimates! There’s reasons why I’ve always been a fan of Samsung fitness trackers! Of course, these aren’t controlled, peer-reviewed results. I tried to set up conditions that would be easier to control in these tests on a treadmill. The incline was the same throughout each session. I walked on a treadmill for 20 minutes at 3.5 mph and then ran for 7 minutes at 3.8 mph. Hey, I’m not a runner but by test three on day three 7 minutes didn’t feel like it was going to kill me! The results are very interesting. In the walking test the Fenix was quite a bit closer to the METs calculator estimate but the distance estimate and pace seemed off. The PowerWatch’s distance and pace estimates are on par with what the treadmill data indicated. The METs calculator estimated I burned 98 calories while the PowerWatch estimated 69 and the Fenix 5s estimated 105. In the running test, the PowerWatch’s calorie estimate was nearly identical to the METs calculator. The PowerWatch estimated I had burned 73 calories while the MET calculator estimated 72 calories. 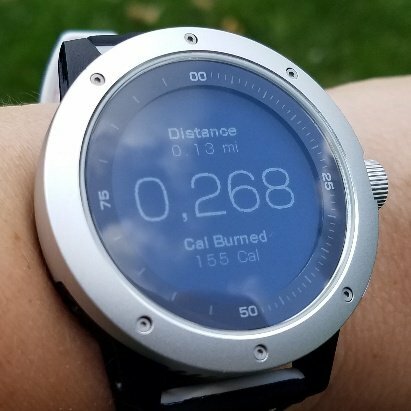 The Fenix 5s in this test estimated quite a bit fewer calories as compared to the walking test however the distance and pace was more in agreement with the PowerWatch this time. It’s also important to point out that the speed on the treadmill was set to 3.8 mph but my pace had me closer to 5 mph. So I used my pace estimated speed in the calculator instead of the 3.8 mph. One of these days, I’ll need to invest in a better treadmill. No wonder I have so much trouble running on that thing. I’m probably going way faster than it says! So, it’s a good thing I did these tests. The following results are a second round of tests, again , stopping the treadmill and workout and then running for 7 minutes. In these tests, I compared the PowerWatch versus the Fitbit Versa. The PowerWatch appears to have underestimated calories burned by almost half while the Fitbit Versa (see on Amazon) appears to be much more accurate. The estimated distance between the two is very similar however. And the results for running again have the PowerWatch very close to the MET calculator estimate while the Versa seems to have underestimated. The calculator estimated I burned approximately 72 calories during the run. The PowerWatch estimated 76 and the Versa estimated 56. One conclusion I can possibly draw from these results, and the results from the outdoor walks, is that the PowerWatch is very good at estimating calories burned using the Running Mode when I’m running or jogging but not nearly as accurate when I’m walking. Unfortunately, the PowerWatch isn’t a multi-sport watch, so if you try to use it to estimate calorie burn from other types of workouts besides running, it’s not accurate at all. For instance, when I’m riding a stationary bike and everything else is telling my I’ve burned close to 300 calories after 50 minutes of cycling, the PowerWatch estimates much, much lower than that. 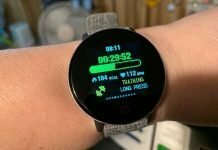 Hopefully, in the future the watch will support more than just running but if you’re a runner this might be a good watch for you to help you know how many calories you’re really burning. It’s calorie burn algorithm appears to be set up very well for running. At the time of this review, the mobile app is pretty much non-functional. I haven’t been able to get the watch to sync data for a few days. The app was updated recently and it appears to have messed up something. Before, I wasn’t having any trouble syncing over data and others are experiencing the same issues I am. It’s affecting both Apple and Android users, so hopefully it is resolved soon. When it is I will update this portion of the review. Other than that, the mobile app is basic. 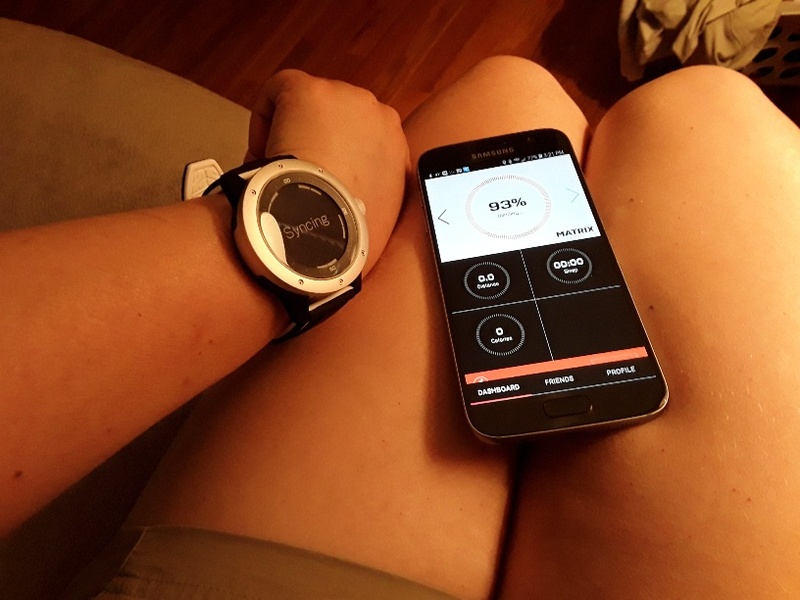 You can view your data on it for steps, sleep, and any running workouts you might have done. You can also set your goals (steps, distance, calories burned) and whether you would prefer metric/imperial or 12/24 hour settings. There is an option for selecting a new watch face but it isn’t enabled, at least at the time I’m writing this. The Matrix PowerWatch is a well-built watch with good looks. It doesn’t feel cheap by any means. It is limited in functionality but it’s doing something that no other watch is doing right now and that’s using body heat to charge it and calculate calorie burn. The main issues I have with it are firmware related because I know it’s capable of doing better at sleep tracking than it’s doing now. Other things could be tweaked to get distance estimates a little better but they’re not bad considering it doesn’t have GPS. The main thing that is missing are those watch faces because without them I have no idea how much battery power is left or how much power I’m sending it (burned calories in the form of heat). 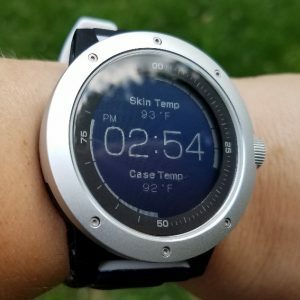 The watch does tell me the temperature difference between my skin and the watch case and this is important because your skin has to be hotter than the case in order for heat to transfer through the watch. Heat moves from warmer to cooler places. So, when the case is the same temperature or hotter than your skin, the battery can’t be charged. If you live in a really hot climate, and aren’t able to get into cooler places, this probably wouldn’t be the watch for you. 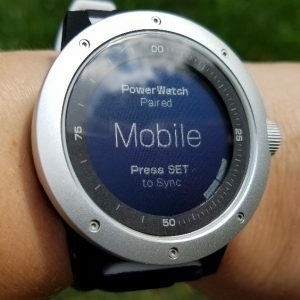 So would recommend the PowerWatch? If the calorie estimates for running remain to be as good as they tested out for me, then I could recommend it as a runner’s watch just so you’ll possibly get more accurate calorie burn estimates. I would like to see the app work, of course, and those watch faces before I would recommend it to anyone else… just yet. Most of all, the Matrix PowerWatch is a watch for watch collectors and geeks like me that appreciate new technology. The watch probably appeals more to men than women but hey some of us women like technology too! I’m going to hold off assigning a star rating for a few more weeks to see if a new firmware update is rolled out fixing the sync issues and poor sleep monitoring.